Slemish, historically called Slieve Mish (from Irish: Sliabh Mis, meaning "Mis's mountain"), is a small mountain in County Antrim, Northern Ireland. 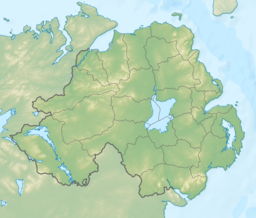 It lies a few miles east of Ballymena, in the townland of Carnstroan. Tradition holds that Saint Patrick, enslaved as a youth, was brought to this area and tended sheep herds on Slemish, and that during this time he found God. Slemish is the remains of the plug of an extinct volcano. The plug is made of olivine dolerite and was formed during the Palaeogene period of the Earth's geological history. Its distinctive appearance —its upper reaches are very steep and rugged, in contrast to the tidy fields on its lower westward-facing slopes and the relatively flat bogland to the east— causes it to dominate the landscape for miles around. Slemish is within an Environmentally Sensitive Area (ESA) and, therefore, helps to protect and manage the fragile animal and plant communities that inhabit its slopes. An ideal location for bird watchers, large black ravens, buzzards, wheatears and meadow pipits can be seen regularly. Slemish Mountain is the legendary first known Irish home of Saint Patrick. According to legend, following his capture and being brought to Ireland as a slave, Patrick worked as a shepherd at Slemish Mountain for about six years, from ages 16 to 22, for a man named Milchu (or Miluic). It was during this time that Patrick turned to frequent prayer as his only consolation in his loneliness. In a vision he was encouraged to escape and return home. He did this, then became a priest and returned to Ireland, allegedly to convert his old master. The legend goes that his own real conversion took place while on Slemish out in all weathers, communing with nature and praying continuously. As Patrick was not the first Christian Bishop to visit Ireland, his ministry was confined to the North. Here he established churches and an episcopal system. One such church is thought to have been founded at the nearby site of Skerry Churchyard. In later times, Slemish was the site of a United Irish camp during the 1798 rebellion in County Antrim. Slemish Mountain is open year-round, and on Saint Patrick's Day (17 March) large crowds walk to the top of the mountain as a pilgrimage. The one and a half kilometre round walk to the summit and back takes approximately one hour in good weather. Excellent views can be had of the Antrim and Scottish coasts to the east. Ballymena town, Lough Neagh and the Sperrin Mountains are all normally visible to the west whilst the Bann Valley and the higher summits of the Antrim Hills can be seen to the North. The 180 metre climb is steep and rocky. There is a parking facility with interpretation boards and washrooms on site. Slemish features in Dennis Kennedy's book Climbing Slemish. The book chronicles the history of a family over a whole century of Northern Irish life. AI777.1 Kl. The battle of Sliab Mis, in which Nia, son of Cú  Allaid, fell. ^ Preston, J. (1963). "The dolerite plug at Slemish, Co. Antrim, Ireland". Geological Journal. 3 (2): 301–314. doi:10.1002/gj.3350030207. ^ Lemon, Kirstin (16 March 2016). "Top 10 Geological Sites to Celebrate St Patrick's Day". GeoBlogy. British Geological Survey. Retrieved 29 July 2016. ^ "Saint Patrick". Irish Historical Studies: Joint Journal of the Irish Historical Society and the Ulster Society for Irish Historical Studies (9). 1943. ^ "WalkNI - Slemish". Outdoor Recreation Northern Ireland. Retrieved 27 March 2018. ^ Dennis Kennedy (2006). Climbing Slemish: An Ulster Memoir. Trafford. Retrieved 17 March 2016. Wikimedia Commons has media related to Slemish. Landscapes Unlocked - Aerial footage from the BBC Sky High series explaining the physical, social and economic geography of Northern Ireland. This page was last edited on 27 February 2019, at 03:37 (UTC).